15/12/17: Commencez à ajouter un DEM sur certaines cartes. Je continuerai à ajouter des cartes avec DEM, mais il faudra du temps pour avoir toutes les cartes avec cette nouvelle fonctionnalité. Nouvelles icônes pour les éléments (POI) suivants: entrées de grotte, monument, monuments. La couleur de fond des parcs, zoos, golf, aire de jeux, pique-nique et camping est changeé pour un vert plus clair, pour améliorer la visibilité des autres éléments de la carte. Polygone des zones humides simplifié, aussi pour améliorer la visibilité des autres éléments. 18/11/17: Certains schémas d'aménagement du territoire qui rendaient difficile la visualisation d'autres éléments de la carte ont été remplacés par d'autres qui sont plus faciles à interpréter. 25/03/17: Most buildings in urban areas removed, what improves general map visibility and let faster rendering of the map. Buildings in rural areas are kept as they are help orientate. 25/03/17: Improvements on route and arrival time calculation in urban areas. 24/03/17: Contour lines visibility improved on topographic maps, specially on areas with some background, sush as forest, nature reserves, etc. 07/02/17: Mountain passes added to the map with their altitudes as well as survey points and peaks altitudes. 14/12/16: Some errors in route calculation and fixed and instructions at crosses improved. 12/1016: New Legend section in the menu, where you can see a description of all the elements visible on the maps. Improvement of visibility of several elements in Night mode. Addition of some new icons to simbology. 26/03/16: Nueva simbología específica para las principales compañías de bancos. Permite identificar de qué banco se trata por el icono que aparece en el mapa. 28/06/16: New specific simbology for many barrier types: gates, bollards, cattle grids, lift gates, cycle barriers, stiles, kerbs, entrances and blocks. 26/03/16: New specific simbology for main bank brands. It lets identify which bank it is by the icon displayed on the map. 24/03/16: New parameter to identify map version. It avoids the error that ocurred when sending a map to device from BaseCamp as it didn't detect that the map had changed. 15/03/16: New simbology to distinguish intermitent and permanent rivers, streams and canals. 14/02/16: Improved Central America and Caribe map division so that it is correctly shown roundabouts turning side, depending on the side of the road it is driven in the given country. 03/01/16: Fixed a problem in Mexico contour lines by which many areas of the map didn't show contours. Names of roads, streets, lakes and reservoirs have been removed at low zoom levels, as this information is irrelevant at those zoom levels. It has two main effects: the map is less cluttered and now place names are displayed, which is much more useful information at those zoom levels. Also at low zoom levels streets and other minor roads are rendered with a thiner type of line, so that they don't overlap. Names of rivers, streams and water bodies are displayed in blue color, making easier to identify them at first sight. Locality names are now rendered in grey. 03/08/14: Specific layout for picnic areas and historical sites added. Improvement of camp and caravan sites rendering. 27/07/14: The density of wood polygons has been reduced to improve visibility of tracks, paths, streams and other map elements. 07/06/13: New overview map to be used on BaseCamp, MapSource and QLandkarte GT. Until now, overview map was empty, just containing information about the tiles that form each map, so that when you zoom out the map was blank. Now it shows basic information, such as land, sea and country border and capital. It lets you find more easily the area of your interest. Rendering speed of the map at low zoom levels is quite faster also. 12/04/13: The information shown at motorway and trunk road exits has been improved. Now the exit number and the direction that exit leeds to is displayed. 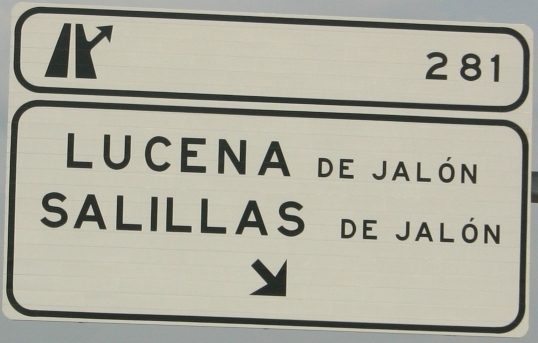 For example, for the exit in the image below, it will show «Exit 281 Lucena de Jalón; Salillas de Jalón». 04/04/13: A new section is incorporated with maps specially designed to be used in trucks (+info). In it you will find maps of the different countries, which have into account physical properties of the ways (such as width, maximum height, etc.) or legal constrains that may affect these vehicles (maximum permitted weight, etc. ), to avoid them when routes are calculated. 31/03/13: Contour lines of India and Peru updated, including more data from www.viewfinderpanoramas.org, which are more accurate, specially in mountainous areas. 24/03/13: Contour lines of Argentina and Bolivia updated, including more data from www.viewfinderpanoramas.org, which are more accurate, specially in mountainous areas. 20/03/13: Contour lines of Ecuador and Uruguay updated, including more data from www.viewfinderpanoramas.org, which are more accurate, specially in mountainous areas. 18/03/13: Contour lines of Ethiopia and Tanzania updated, including more data from www.viewfinderpanoramas.org, which are more accurate, specially in mountainous areas. 17/03/13: Contour lines of Algeria, Tunisia and Vietnam updated, including more data from www.viewfinderpanoramas.org, which are more accurate, specially in mountainous areas. 15/03/13: Contour lines of Morocco and Central America updated, including more data from www.viewfinderpanoramas.org, which are more accurate, specially in mountainous areas. 15/03/13: Map of Mexico, America Central and Caribe split in two maps: Mexico in one side and Central America and Caribe in other, for a more convenient use. 23/02/13: House number searches enabled when searching for addresses. 31/12/12: Fixed a problem in the TYP files that caused some of the POI icons (motorway exits, power towers, communication towers) not visible. Color of all water elements (sea, bays, reservoirs, rivers, streams) is now the same, to avoid inconsistency between some programs and devices. 03/11/12: I have changed the code used for places tagged as place=locality so that they are not included in the search indexes of inhabited places, as they are not such places and they increased excesively the size of the indexes, making searches work too slow. 13/07/12: New Portugal contour lines generated with data from www.viewfinderpanoramas.org instead of SRTM, for better accuracy. Madeira is also covered by the new contour lines. 20/05/12: Spain contour lines (IGN) number of tiles reduced and integrated on files for GPS and Mac OS X. Street searches now works on topographic map. 13/04/12: New MapSource/BaseCamp installer for Canary Islands that includes the posibility of installing a Topographic version of the map. High resolution contour lines for Canary Islands in a separate download. 20/03/12: Started to replace files for MapSource/BaseCamp by an auto-installable file, simplifying considerably installation. Additionally, this system includes some checks to avoid errors during installation. 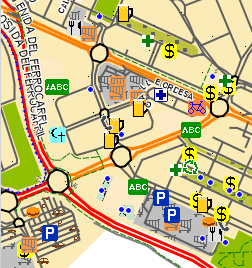 15/03/12: More improvements in map rendering: more than 30 new icons have been added for POI's: bar, cafe, restaurants, gas-station, car repair and rental, banks, airport, library, hospital, etc. Added some polygons that were missing: military areas, airports, electric stations, damp, scrub, scree, beaches and bays. New rendering of woods by categories: coniferous, broad-leaved, mixed and palm. Cities are now rendered by categories, according to the number of inhabitants and size, using different icons. New icons for some elements of the map: power towers, antennas. Complete translation of the legend into the following languages: Spanish, English, German and French. 04/03/12: New high resolution contour lines based on data from the National Geographic Institue of Spain (+info). 11/02/12: In consideration to the great number of Argentinian users of this site, I have added the map of Argentina to downloads. Enjoy it! 04/02/12: Portugal topographic map: I have modified contour lines maps so that they are correctly displayed on MapSource. 01/02/12: Vietnam topographic map: fixed contour lines visualization problem on MapSource. Data from SRTM have been substituted by data by Jonathan de Ferranti for some mountain areas (Pyrenees and Picos de Europa). The new data cover some areas that showed no contour lines till now. Many artifacts have been removed: those oblique lines that crossed the map and vertical and horizontal lines that appeared in some sea areas. Artifacts in map borders have also been removed. In addition to the visual effect, all these artifacts caused errors in profile calculation. After many test, I believe contour lines visualization on MapSource is finally solved, although I can't guarantee it, as in some previous occasions it also seemed to be solved and after some time contour lines disappeared again. Contour lines are now adapted to Spain boundary and OpenStreetMap base map, without contour areas lacking a map below, causing an unnecessary increase of file size. Contour lines interval is now 20 m, categorized at 100 m and 500 m. This way the map looks less saturated of lines and other elements of the map are better seen. If someone thinks 10 meters is better, just comment. The number of tiles for contour lines has been reduced to just 14 and each of then is identified with the name of the biggest city included in the tile, what eases greatly enabling/disabling contour lines layer in devices that list all tiles in map setup menu. Topographic map in BaseCamp format added for download. 22/01/12: I have added a comment form to home page and in the next days I'll add it to the rest of the pages. I hope this improvement will provide a more fluid communication with the page users, to ask doubts, ask for new maps, report any problem with downloads, etc. 11/01/12: now the files under column 'File to copy on gps/navigator device' already include index for Address search. It's no longer necessary to send the map to device using MapSource. 02/01/12: fixed a bug that maked villages unfindable. 28/02/11: now 'Search by address' option of the GPS does work, but only if the map is sent to device using MapSource o BaseCamp programs. 12/02/11: added maps in gmapi format for download, to be used on Mac OSX. 28/01/11: corregidos 2 problemas en la visualización del mapa topográfico. Uno afectaba a MapSource, en el que las curvas de nivel a veces no se veían, mostrando tan solo los números correspondientes a las alturas de las curvas. El otro problema afectaba a los aparatos, haciendo que el fondo del mapa se viera azul, como si fuera mar en vez de tierra. 14/01/11: añadida la capacidad de mostrar perfiles de los recorridos calculados en MapSource cuando se usa el mapa topográfico de España Peninsular y Baleares. 09/01/11: se ha igualado el color de los ríos y los embalses y otras masas de agua, eliminando el mal efecto visual que había hasta ahora. 03/01/11: desde ahora los túneles de vías férreas se representan en el mapa con un simbolo similar a los tramos que no son túneles, pero atenuados. Antes no aparecían, por lo que las vías aparecían incompletas. 02/01/11: solucionado problema en la búsqueda de ciudades en los mapas de Canarias y Marruecos que impedía usar el menú Buscar->Ciudades en MapSource y en los gps. 22/12/10: incrementada la visibilidad de las carreteras 'primary' y 'secondary' en el mapa de Marruecos. 11/12/09: incluida la información para que funcione la opción "Evitar carreteras sin asfaltar". Hasta ahora podía enviar por caminos y otras vías sin pavimentar aunque se marcara esta opción. 09/11/09: añadidos los índices necesarios para poder hacer búsquedas por dirección. Funciona en MapSource, pero para que funcione en los aparatos hay que enviar los mapas usando MapSource, no vale copiar el archivo gmapsupp.img directamente. 16/10/09: desde ahora se tienen en cuenta los pasos de peatones, semáforos, stops y otros elementos que obligan a reducir la velocidad para el cálculo de la velocidad de las rutas, aplicando una pequeña penalización por cada uno de estos elementos. 03/10/09: incluidos numerosos tipos de Puntos de interés que faltaban en el mapa. 26/08/09: ahora aparece el mar en algunos mapas (Canarias y Península+Sur de Francia). Hasta ahora sólo se veía una línea azul correspondiente a la línea de costa. 28/05/09: incluida la velocidad máxima permitida de las vías en el cálculo de las rutas. Esto mejorará el cálculo en zonas urbanas, dando preferencia a las circunvalaciones sobre el centro de las poblaciones y también dará un cálculo del tiempo en llegar mejor. 28/05/09: incluida una franja del Sur de Francia en el mapa de la península y eliminados los cortes en las vías entre España y Portugal. 15/03/09: se ha añadido la capacidad para indicar las salidas de autopistas/autovías y mostrarlas en pantalla. Hasta ahora en vez de “Salga a la derecha” indicaba “Manténgase a la derecha” o no indicaba nada. En los GPS con la opción de búsqueda de salidas también se pueden buscar, aunque es necesario seleccionar el mapa OpenStreetMap primero en el menú contextual, ya que de lo contrario toma las salidas del mapa base. 01/04/09: solucionado el problema del tiempo excesivo en recalcular una nueva ruta cuando se abandona la propuesta. 23/04/09: se han simplificado los datos en los niveles más bajos de zum, con lo que mejora la rapidez en dibujar los mapas y disminuye el tamaño de archivo.